The first movement opens with a strong statement of a motif by the brass which is immediately followed by a highly contrasted restatement in woodwinds and melodic percussion. The climatic chords of the first yield to the calmness of the second movement which incorporates an isorhythm (rhythmic theme) as a further means of unification. The third movement centers around a Bach chorale melody, "O world, I Now Must Leave Thee, " the words of which continue, "from here I take my journey." Considering the prominent use of "Land of the Empire Builders" (the Oregon State song) and numerous American folk tunes in the finale, it seems likely that the chorale in the third movement carries with several possible einigmatic connotations. West German composer Bertold Hummel has taken his first look at Oregon and found that its countryside matches what he had in mind when he wrote his latest symphony Oregonsinfonie. What he has seen of the state so far, he said Thursday, also reminds him of Germany's Black Forest. Hummel arrived in Ashland Wednesday evening with his wife, Inken, in advance of the world-premiere performances of his newest symphonic work. During an interview on the Ashland campus Thursday, Hummel recalled that he agreed to a request by McKee that be write the Oregon Sinfonie for the SOSC band. That agreement was reached a year ago while McKee was visiting Hummel's home City of Wuerzburg. McKee, director of bands at the Ashland college, was on sabbatical leave at the time, and had been well acquainted with Hummel's music for more than a decade. Hummel agreed to the commission. But it was not until later, he recalled, that he decided on the title for the work. That came after he had received - as a gift from McKee - an album of Oregon scenes by photographer Ray Atkeson. Scenes of Oregon from that album, he said, helped provide him with inspiration for his Oregon Sinfonie. The 30-minute work, primarily in its final movement, incorporates several American folk tunes, including "Skip to My Lou" "Land of the Empire Builders" (Oregon's state song), and "Tom Dooley." Hummel laughed when recalling that his 9-year-old Sons were astonished to learn that he was planning to travel to Oregon just because he had written a 30-minute piece of music. "They asked me" Hummel said: "For 30 minutes. you are going all the way to America?" After his guest appearances in Oregon, Hummel plans to travel to Cleveland, Ohio, for a lecture at Baldwin Conservatory, and then on to Potsdam, N.Y., to lecture at the Crane School of Music. At Potsdam, Hummel said, he also is scheduled to meet with American composer Aaron Copland, whose music he has long admired. "1977 was a good year." In saying this, the Würzburg composer Bertold Hummel is not referring to wine but is making a brief resumé of his creative work in the current year. He completed a short time ago a commission from the USA for a large symphonic work for around 100 wind instruments. The commission was from the "Southern College Band Convention of America" in Oregon, where the world première of the opus will take place in March of the coming year in his presence. Behind the long name is an organisation covering music colleges, which in the United States are always integrated with universities. The Symphony in four movements was completed in two months and is probably, after a series of works by Hummel in almost all areas of music ("how many I can't exactly say, as I don't use opus numbers"), the most extensive to date. The number of wind instruments required is enormous and corresponds to to a complete symphony orchestra. In the clarinets alone, fifteen are required in three blocks of five! Further, six flutes and four piccolos, bass clarinet, bassoons, saxophones, trumpets, horns, tubas and the typically American Susaphone. In addition, five percussionists are involved, using everything that belongs to the trade. A motto (Hummel deliberately avoids using the word theme) is presented in the first movement (Maestoso-Allegro) and is so to speak illuminated and penetrated by light from all sides. In the second movement, an Andantino, a gracious idea is developed. In the Adagio, a song-like idea is added and is led, in a constant build-up, to a climax, from which it then fades. The Finale brings with it an unusual number of rhythmic movements, during which the hymn of the State of Oregon appears with increasing clarity and finally merges contrapuntally with the motto. In all this, one musical idea follows on the heels of the other and jazz interludes and even the melody, recognised by every ear over there, of "Yankee Doodle" are worked into the piece. 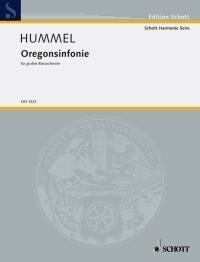 The interesting instrumentation is one very good reason for asking the question of where and how Hummel's work is to be placed in contemporary music. Certainly not in the very front line of the avant-garde. "I was always an evolutionary but never a revolutionary", says the man born in Hüfingen in south Baden, whereby he emphasises that he has an absolutely open mind regarding everything new. However, "Music should be an utterance coming from the inner person. " Early in 1977, I was preparing to take a sabbatical leave from Southern Oregon College. I had decided to use the time to take a 6-week trip through several European countries with the intent of commissioning new works for band. Because I had played Bertold Hummel's "Suite for Clarinet" on several occasions and liked it very much, he was one of my composer choices. Some of my saxophone students at SOC had played Ida Gotkovsky's "Brilliance," and this was another composition that caught my attention. I wrote letters to Hummel in Germany and Gotkovsky in France and sat back waiting for a response. During the 1977 European trip we stopped first to meet with Paris Conservatory composer, Ida Gotkovsky, at her Paris flat. Her husband, Marc Giullou, spoke good English and he helped us discuss the idea of writing a major composition for American bands. We immediately sensed a bond with them, Ida agreed to my paltry $500 offer for the commission and a few days later we were invited to their 200-year old home in Le Perray en Yvelines outside Pairs. It was only the beginning of a lifelong friendship. Several weeks later we had made our way to Würzburg, Germany where Bertold Hummel served as President of the Hochschüle für Musik. Invited to his home, we once again fell into an immediate friendship with Bertold and his wife, Inken. A bit shaken from the look I got from Ida when offering the commission dollars in France, I started that conversation in my just-OK German with Bertold, "How much do you receive for your commission works?" He went on to tell me that most of his work outside of the conservatory was for West German Radio. "From them I receive $1000 per minute of music composed," he said. After recomposing myself, I jokingly said, "Well, then, could you perhaps write me a 30-second composition? I have only $500 to offer." Bertold broke out with his infectious laugh and said, "For that, I can definitely write you something more than 30 seconds in length." The completed work that arrived mid-Summer of 1977 was a four movement, 26-minute symphony! The end of story is even more amazing. Ida's Poeme du Feu (a 15-minute, 2-movement work) also arrived that summer. That and the Oregon Sinfonie provided a solid foundation for the SOC Wind Ensemble's program at the Northwest CBDNA in February 1978. It was at that point that I decided to make the entire program new commissions, new arrangements and special performances. My good friend and SOC colleague, Glenn Matthews, wrote Festival March. I made an arrangement of Wieniawsky's "Romance" from the Second Violin Concerto and featured another SOC colleague, violinist, Fred Palmer. The program ended with Alfred Reed conducting the West Coast Premiere of the "Armenian Dances, Part 2." Not only did Hummel and Gotkovsky compose the works for this special event, both traveled to America with their spouses paying their own expenses to join us for the 10-day period leading up to performances in the Salem area, at the CBDNA at Western Oregon College and at home in the SOC Music Recital Hall. 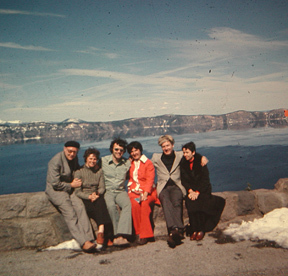 Each spent time with the members of the band, traveled on the tour buses, visited our home on several occasions and enjoyed special trips to the Oregon coast and Crater Lake. It was a truly magical experience in so many ways. Little did I know that within a dozen years it would open up the world to our endeavors with Bandworld Magazine, Western International Band Clinic and, subsequently, the American Band College.